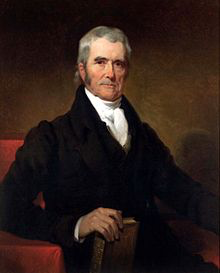 On this date in 1801, John Marshall—at the time simultaneously serving as President John Adams’s Secretary of State and Chief Justice of the United States—signed the commissions of the “midnight judges,” setting in motion events that would lead to the landmark Supreme Court case Marbury v. Madison. The ruling, written by none other than Chief Justice Marshall, gave the Court its first opportunity to strike down an act of Congress and thereby established the practice of judicial review or the power of the Court to declare laws unconstitutional. Among these last-minute appointments was William Marbury, whom President Adams appointed as a Justice of the Peace for the District of Columbia. Adams’s intentions were clear: he sought use the closing days of his administration to push through as many federal judges and other appointees as he could before President Thomas Jefferson, who defeated him the previous November, took office. When President Jefferson took office on March 4, he refused to deliver the commissions of the midnight judges. Marbury petitioned the Supreme Court to order Jefferson’s Secretary of State, James Madison, to deliver his commision and finalize his appointment. In his opinion of the Court, Marshall held that Marbury had come to the wrong court. The Constitution, he concluded, allowed the Supreme Court “original jurisdiction” in only a limited number of specified situations, and they did not include the kind of order Marbury asked for. Since Marbury was only following the guidelines of a provision of the Judiciary Act of 1789, Marshall concluded that this provision was unconstitutional. Jefferson denounced the Court’s bold assertion of its own authority to strike down an act of Congress, but Marshall had given him nothing to defy, since it was the Court itself that was refusing the grant of power in the Judiciary Act. It was a brilliant move on Marshall’s part, and the ruling proved a critical foundation for the expansion of the Court’s authority in the coming years. This Post was Written by ISCOTUS Fellow Clayburn Arnold, Chicago-Kent Class of 2021, edited by ISCOTUS Editorial Coordinator Matthew Webber, Chicago-Kent Class of 2019, and ISCOTUS Co-Director and Chicago-Kent Faculty Member Christopher W. Schmidt.